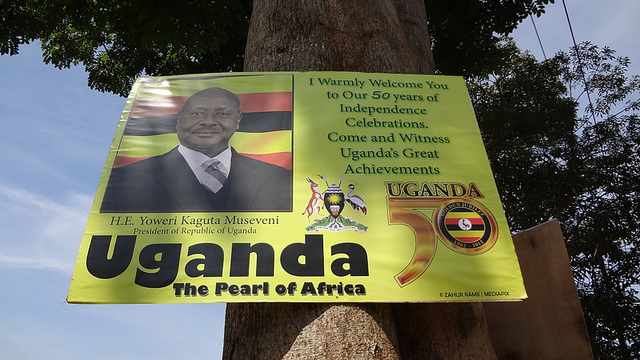 KAMPALA, Uganda – Today marks Uganda’s 50th Independence Day. The anniversary has been long-awaited and with some excitement. The main opposition group, For God and My Country, headed by longtime opposition leader Kizza Besigye, has staged rallies and protests in Kampala in the week leading to today’s celebrations. Besigye was arrested twice and kept under house arrest for the last two days to prohibit him from entering Kampala city and leading fresh protests. Police also roughed up three journalists and confiscated their equipment as they reported from the main rally on October 5. Over the weekend, the Ugandan army was ordered into the streets and deployed at the Constitutional Square, the Parliament, and other key areas of town. The soldiers’ presence cooled down the protesters, and the last few days have been calm in Kampala. Despite a rocky week, today’s celebrations went ahead without disturbances. From early morning, the city was simmering with joy and excitement as tens of thousands of Ugandans flocked to Kololo airstrip, the main venue for the event. Around noon, the guests of honor started to arrive, including presidents from nine African countries. President Robert Mugabe of Zimbabwe was present along with other close allies of Uganda, including Paul Kagame from Rwanda, Salva Kiir from South Sudan, and Joseph Kabila from Congo. Prince Edward, the Duke of Kent, represented the U.K. government. His participation was particularly symbolic because he was the very person who officially handed over the powers of the state to Apolo Milton Obote, the first president of Uganda, on the country’s Independence Day 50 years ago. The rest of the day’s program was made up of cultural dances from all over Uganda, the presidential speech from Yoweri Museveni, and then the highlight of the day: the Ugandan air force’s show in the sky over Kampala. They flew three fighter jets in formation, with the colors of the Ugandan flag—black, yellow and red—streaming from the tail. Two jets also reached supersonic speed, creating a powerful noise that shook the guests at Kololo airstrip. From witnessing today’s celebration, it’s clear that Ugandans feel pride for their country and the achievements of the last 50 years. But there is also a growing demand for political change. President Museveni has held power since 1986, and many question whether he is the right person to take Uganda into the next 50 years. Health facilities, schools, and infrastructure still need considerable development. (Ironically, as I’m typing these last lines power in this part of town cut off.) Uganda still has a long and difficult road ahead to see the prosperity and development that many here continue to dream of.